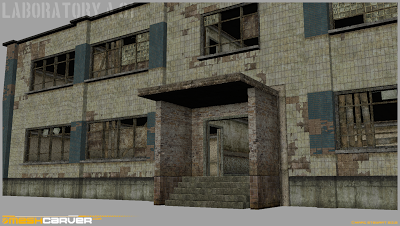 This is a basic form of one of the buildings in STALKER. In that game, it was an unnerving looking structure to enter, especially at night, so I thought it best to include it in some similar guise for the island I'm making. I've added little details like some of the ceiling panels are either hanging off or are on the floor from years of relentless weathering in The Zone. At this point, there's minimal set decoration, as before I start on that I want to make sure each larger structure is working fine by itself and then I'll start to fill in in the little plain areas but always within the confines of the ARMA engine, as it's performance first..! Anyway, I hope you like, and it's crits/suggestions welcome as always. I'm following this blog with great interest. Even if this takes three years to make, I'll wait patiently. The buildings thus far look great. You should make sure to include some underground sections a la Shadow of Chernobyl's Agroprom. thanks for you comments man, appreciated. Aye, I'll include some underground sections too, but I really need to wait to see what the support for them is like from the ARMA3 engine sadly.